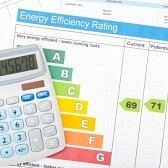 Think your home is already energy efficient? Double check with this home efficiency calculator developed by the Sustainable Energy Resource Center (SERG). You'll need to gather your heating and utility bills and know the total number of square feet that you heat.